Remember: next weekend, May 30 and 31, is the time to do the spring census. Spare some time to count the birds in your garden! Remember that we are getting close to the Spring Census 2015. The last weekend of May, days 30 and 31, are those in which we ask for special participation in Ocells dels Jardins in order to do a general count in as many Catalan gardens as possible. The procedure consists of doing at least one count as you usually do, during the time you want on Saturday or Sunday. It is not necessary to dedicate a specific amount of time but we recommend at least half an hour in order to have a representative sample. Jointly with the Winter Census, we want to have two snapshots in the year with standardized data. So, spare some time at the weekend May 30 and 31 for your garden! In ODJ we have had several reports of a variety of species of psitacidae -the family parrots belong to- in our public gardens. During the last few years, some species of parrots and parakeets have colonized the public gardens of our cities, starting generally in the city of Barcelona. Present in Catalonia since some decades ago, there are two species that are already well established, the Monk Parakeet and the Rose-ringed Parakeet, and have entered the official Catalan list with the category Introduced but considered part of our bird list. But apart from these two very well settled species with large populations, in OdJ some other introduced or escaped parrots have been reported. For example, there is an observation of Fischer's Lovebird and another of a Budgerigar in a flock of Monk Parakeets, both in the Institut Lluís Vives of Barcelona; none of these birds was seen again and therefore it seems likely that both were recently escaped birds, although they are being reported elsewhere. Better settled seem to be the populations of Mitred Parakeet and Blue-crowned Parakeet with observations in Sabadell (up to 25 birds) and Barcelona; these two species can be increasingly seen in some localities of the Barcelonès and the Vallès, with the city of Barcelona as their central point of dispersion. Exotic species are more and more frequent in many cities and urban habitats all over the world and, as we can see, the gardens of our cities follow the same pattern of colonization, particularly the birds of the group of parrots and parakeets. 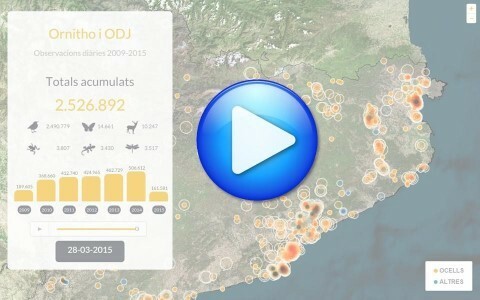 The OdJ prize of the last month of March has been for Guillem Brufau after having introduced data during all 31 days of March with a total of 364 sightings. Congratulations for the constancy! Guillem, 50, lives in Aiguafreda (Vallès Oriental) and works as a mechanic in nearby La Garriga. Fond of wildlife photography for 25 years, he became increasingly interested in birds in recent years. He states that after taking the courses of Introduction to Ornithology and Bird ID of the ICO, he received a good push to keep on this trend. Currently, he is an active collaborator of OdJ and introduces sightings of birds in his garden of Aiguafreda, a place with pretty rich bird diversity. Just after Guillem Brufau, follow Lluïsa Pinyol and Jordi Pareja (winner of the month of February) with 30 days of observations each. We remind you that the OdJ prize is the bird guide Guia dels Ocells de Catalunya, País Valencià i Balears by Joan Estrada and an Ornitho notebook. After some delay as a result of a variety of problems, we announce that the winner of the month of February has been Jordi Pareja, after inputting observations during the 28 days of the month with a total of 351 sightings. Congratulations! Also with 28 days and above 300 observation, Guillem Brufau and Maria Serra deserve special mention for their continued participation. Good job! Jordi Pareja, 31, works in a company in the sector of gardening and forest works. So, he spends most of the day in the open air and often in the very same heart of the woods, where he takes advantage of it to be aware of birds that may show up. He lives in Osona and most of his observations in Ocells dels Jardins come from home, where he's got a garden, orchard and some chicken, which food is shared with lots of wild birds. In his bird feeders Jordi strategically places a GoPro with which he obtains high quality images of birds feeding very close to the camera. As you know, Jordi wins a "Guia dels ocells de Catalunya, País Valencià i Balears" by Joan Estrada with drawing by Toni Llobet and Martí Franch, plus an Ornitho notebook. The race goes on open in March so, you know: you can be the next month's winner. The bird guide Guia dels Ocells de Catalunya, País Valencià i Balears and the Ornitho notebook of January go to Josep Lluís Cortés Montesinos, who wins after having introduced data during all 31 days in January with a total of 431 sightings. Josep Lluís Cortés is a 55 year old biologist who teaches at high school. He became fond of birding when he was only 15 in the urban parks of Barcelona, Collserola and several locations in the Pyrenees. He currently lives in Sabadell and his main birding areas are around the Vallès as nearby places but he often travels to the Ebro Delta, Llobregat, Estany d'Ivars, la Garrotxa and el Ripollès. He tells us that he leaves home early in the morning with his eyes and ears tunned on to record our nearest birds of parks and gardens. So, Josep Lluís is naturally born birder who enjoys both familiar birds and those from birding hotspots. Jordi Pareja and Guillem Brufau also deserve special mention since they fall in second and third position, covering also the 31 days of the month. As you know, the race for February is open and all observers who report observations with regularity have options to win. 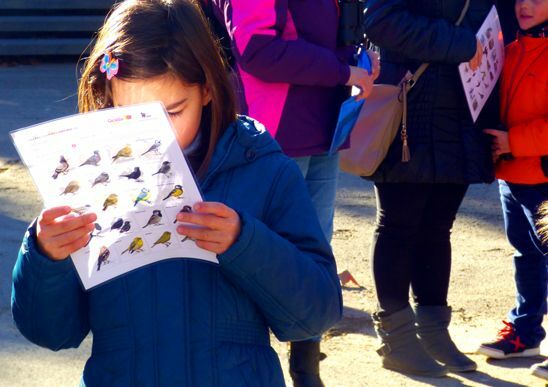 In the weekend of the Winter Census, the ICO organized an activity addressed to fellow members of the Zoo Club of Barcelona Zoo in order to promote the program Ocells dels Jardins among the great public. The activity consisted of a guided tour to watch wild birds in the park which mostly are garden birds. Initially this had to be a small format activity for around 30 people but after just a few hours of being announced there were... 450 inscriptions! Consequently, we decided to have more groups and we could serve 100 people with the compromise that the activity will be in place again on other weekends for those that could not fit in. The success of the call demonstrates the growing interest on birds in our country. Bird watching, either in a garden or in the most remote places on Earth, puts the citizen -nowadays mainly urban and disconnected from nature- in close contact with the environment. The beauty of birds, their behaviors and their proximity to people can enchant even the most insensitive soul. Most of the audience was families with children of various ages in which the kids were those driving their parents to the birding tour with their fledgling but intense passion for bird watching. Birds in the Zoo didn't disappoint and 23 species could be observed in excellent conditions as a result of their amazing tolerance to human proximity. Apart from the classical Robins, Sparrows, Blackbirds and Starlings, it is not frequent to have Cattle Egrets, Little Herons and Laughing Gulls, for example, just one meter away. On the other hand, the Winter Census 2015 has had an excellent response among OdJ users. The record of observations on a weekend has been beaten, reaching a total of 492. Thank you so much for your participation! Remember that next weekend, Saturday 31st January and Sunday 1st February, are the selected days to do the Winter Census. We request you to count all birds in your garden for a period preferably of 30 minutes minimum. Censusing all Catalan gardens at the same time will give us a snapshot of the state of the birds in gardens of our country in the heart of the winter, allowing us to analyze data in a standardized way. Remember that Saturday is the last day of January and that the prize of OdJ Observer of the Monty is still running for January in which you can win the bird guide Guia dels Ocells de Catalunya, País Valencià i Balears, plus an Ornitho notebook. 10 days to go for the Winter Census 2015! Ocells dels Jardins is a citizen science programme in which participants can input data at their convenience but there are two dates when we especially ask to do it in order to have a photo finnish of the state of the birds in Catalonia. 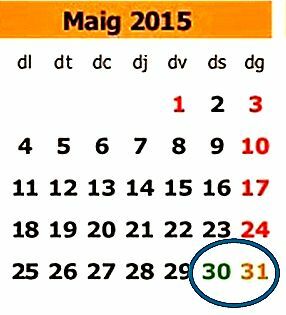 They are the last weekend of January and the last weekend of May. 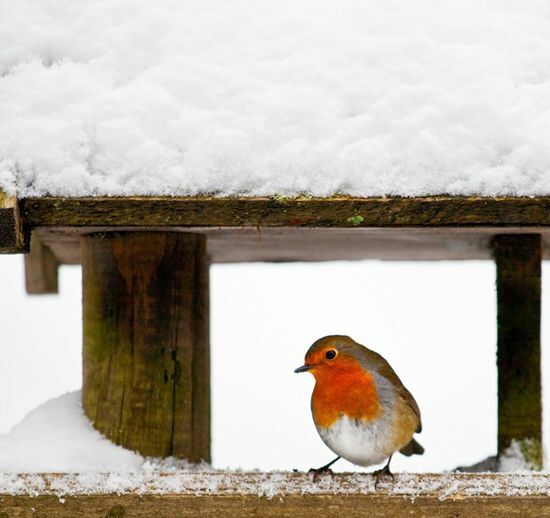 The weekend comprising Saturday 31st January and Sunday 1st February is that of the Winter Census 2015, so we ask you that at least on one of the two days you spend 30 minutes (or as much as you want) to count the birds in your garden (or gardens, if you survey more than one). With such cold weather as we are having these last few days, we are sure that your bird feeders will be very active. Remember to replenish them on the few days before. We have 10 days to go for the census, which will be the first large scale census of the birds that winter in Catalan gardens to be carried out. Next week we will send a reminder but if you are one of those that plans his weekends well in advance, we request you to leave a space for it in your agenda.